Should I be slowing down in that case that upcoming green light turns yellow? How long am I going to be stopped at this red light? These are questions all drivers ask but never really expect to get answers to—unless they’re driving a BMW, now. Last week the German carmaker announced integration of the EnLighten iOS app which uses GPS speed and location data to help drivers anticipate when a traffic signal is going to change. It promises to increase safety since drivers will be less likely to try and race through a stale green light, but also improve a vehicle’s fuel efficiency—and your patience while behind the wheel. 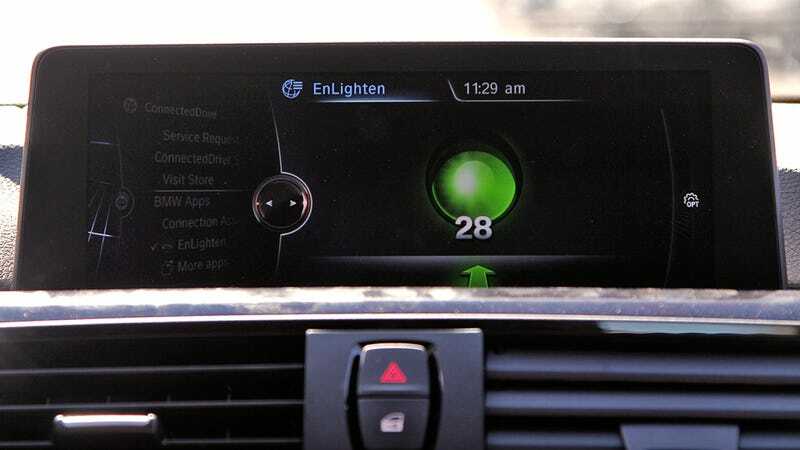 Now that the EnLighten app is integrated into a BMW’s built-in navigation display, drivers no longer have to glance at their iPhone or rely solely on audible signals about the status of an upcoming traffic light. The app’s easy-to-understand interface shows the status of the next traffic light ahead of a vehicle, including a timer counting down to when it will next change, and an indication of whether or not they’ll make a green light traveling at their current speed. The app even knows when your vehicle’s turn signal is on while stopped at a light, and will only show countdown information about a dedicated left or right turn signal if one is available at the intersection. It won’t get you around a corner any quicker, but knowing how much time you’ve got left can help you decide if and when it’s safe to proceed through. There’s a catch, though. Besides requiring your iPhone to be in the vehicle for the connected EnLighten app to work with your Beemer, it also requires your city to have already set up a network of smart traffic signals. So right now it’s limited to Portland and Eugene, Oregon, Salt Lake City, Provo, and Ogden, Utah, Las Vegas, Nevada, and Arcadia and Walnut Creek, California. A very limited number of cities, but if you have absolutely no patience when it comes to waiting for traffic lights, now might be a great time to move.